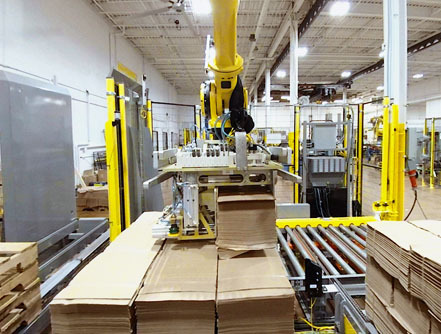 One of the most innovative and successful packaging manufacturers on the planet tasked us with automating the end-of-line packaging systems for a heavy, bulk paper product line that could not utilize a standard palletizing solution. In addition to the inherent challenges associated with palletizing bulk items, our engineers needed to figure out how to process two different sized bundles with top sheets and strapping, and then prepare them for palletizing — all within a very limited space. 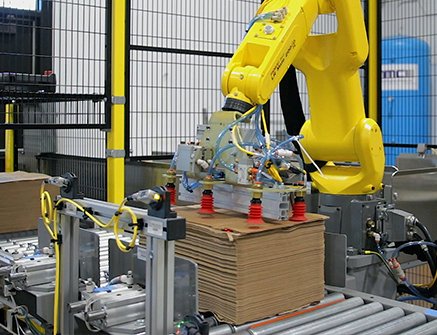 To develop the ideal solution, our engineers evaluated the current processes, equipment and available space which led to the design of a dual robotic system with an integrated strapping machine and automated pallet dispenser. An inbound conveyor system stops and aligns each bundle in preparation for binding. The system then detects the size of each bundle and a FANUC LR Mate 200iD 7L robotic arm retrieves the correct size top sheet for placement. The conveyor moves the bundle to a SAMUEL strapping machine where it is programmed to apply two straps to small bundles and three straps to large bundles. 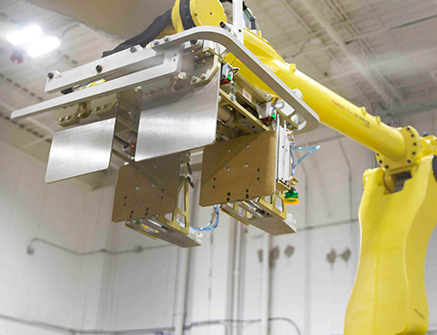 At the end of the conveyor they are picked by a Fanuc M 410 iB palletizing robot outfitted with customized end-of-arm tooling. This custom end effector features forks that pick and place empty pallets into position, suction cups that pick and place two different-sized top sheets onto each pallet, and a combination of clamps and underside forks that position the bundles onto the pallet. Sensors in the system tell the robot whether the bundles are small or large so that it can determine where to stack them on the pallets. The new system not only improved productivity, but it maintained a very small footprint, required little operator oversight and eliminated manual handling of the heavy bundles. 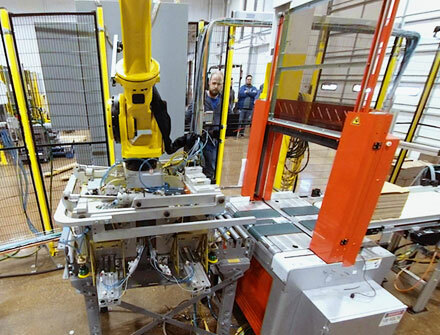 With innovative engineering and the use of two specialized robotic arms, MMCI engineers were able to design a system that completely automated the end-of-line packaging process. At any stage of your automation project, we can help. Call us at 314-438-3300 or fill out the form below.